Pat Marshall (May 26, 1958-September 4, 2010) was curator of furnishings and decorative arts at the North Carolina Museum of History, Raleigh, and co-author (with Jo Leimenstoll) of Thomas Day: Master Craftsman and Free Man of Color (The University of North Carolina Press, 2010). This is a piece that fascinates me. This is a very elegant, elegant piece of furniture for a child. 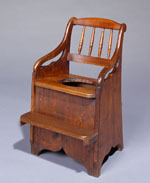 It is a commode chair. A lot of people today would call it a potty chair. The type used for toilet training. It’s unusual in that a lot of families wouldn’t have had a piece like this. I mean, this is a very stylish piece of furniture for its intended use. Oh, it’s very fancy for the time period, and unique. I can’t think of another one that I’ve ever run across. The family is making a statement saying that they can afford to have this in the house and not have to send their little child out either to the privy or to sit on a cold chamber pot. He or she can sit on this elegant piece of furniture. Can I feel how heavy it is? Yes. Day fashioned it in this Grecian style. In the back it has a little door that you open that you would place the chamber pot in. The only alteration to it – somebody later on added this little footrest. Apparently their child had very very short legs and they wanted them to be comfortable. The heaviness comes from the thickness of the boards and that’s a trait we see a lot of in Thomas Day’s furniture. He didn’t use boards that were under three-quarters of an inch in thickness. It is fashioned from walnut, with a yellow pine used as what we’d call a secondary wood. Meaning that he used pine boards to create the interior structure. What would this have cost? It probably would have cost, oh, I would say no more than ten or fifteen dollars. Probably Thomas Day made this between 1840 and 1850. Do you know who he made it for? It was made for the Giles family of Yanceyville, Caswell County [North Carolina].